That was Alan Greenspan back in 2003. This is little different from another of his famous maxims, that anti-fraud regulation was unnecessary because the market would not tolerate fraudsters. It is also a key premise of the blame-the-government crowd (Wallison, Pinto, and most of the current Republican Party), which claims that the financial crisis was caused by excessive government intervention in financial markets. Market discipline clearly failed in the lead-up to the financial crisis. 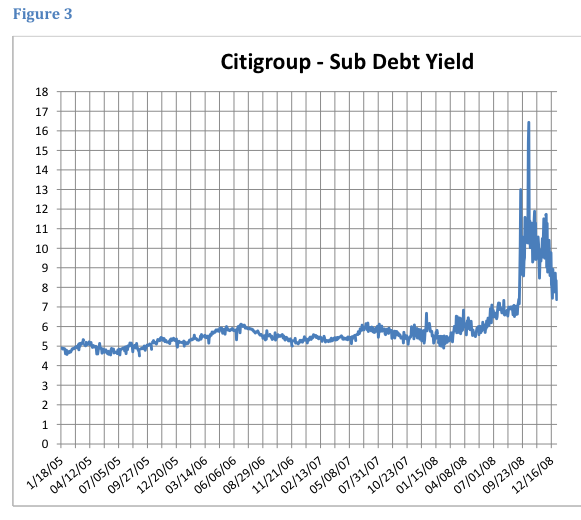 This picture, for example, shows the yield on Citigroup’s subordinate debt, which is supposed to be a channel for market discipline. (The theory is that subordinated debt investors, who suffer losses relatively early, will be especially anxious to monitor their investments.) Note that yields barely budged before 2008—despite the numerous red flags that were clearly visible in 2007 (and the other red flags that were visible in 2006, like the peaking of the housing market). However, one thrust of post-crisis regulation has been to attempt to strengthen market discipline. This is consistent with the overall Geithner-Summers doctrine that markets generally work close to perfectly, and that regulation should mainly attempt to nudge markets in the right direction. David Min (the lead rebutter of Wallison and Pinto’s theory of subprime mortgages, which relied on a made-up definition of “subprime”) has a new paper explaining why this is likely to fail. (The Citigroup chart is from the paper.) 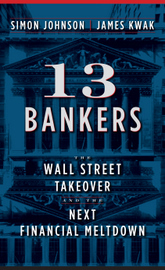 The remarkable thing is that market discipline not only failed to prevent banks from taking on ill-advised levels of risk, but also failed to even identify those risks until well after they were splashed all over the front page of the Wall Street Journal—like the credit rating agencies downgrading Enron mere weeks before it filed for bankruptcy. Min identifies a couple of structural reasons for this failure—reasons that cannot be fixed simply by tweaking regulations here and there. One is that banks’ primary funding sources—whether traditional depositors or other financial institutions engaged in repo transactions—are relatively insensitive to the degree of risk in the instruments they hold. Another is that the key form of market discipline on large banks seems to be that exerted by shareholders—and shareholders like risk, especially when banks are highly leveraged (because they can shift downside risk onto creditors). Ultimately, one of Min’s suggestions is that we simply cannot rely heavily on market discipline as a means of constraining risk-taking by financial institutions. This leaves us with relatively unfashionable tools like higher capital requirements and structural reforms (size and complexity limits). But that’s not nearly sophisticated enough for the Geithner-Summers-Bernanke crew. This entry was posted in External perspectives and tagged financial crisis, financial regulation. Bookmark the permalink. Risk based capital requirements, less capital for what is perceived as “safe” than for what is perceived as “risky”, implies that banks earn higher risk adjusted returns on equity when lending to for instance the “infallible sovereigns”, the housing sector and the AAAristocracy, than when lending to the “risky” medium and small businesses, entrepreneurs and start-ups. And anyone who do not understands how that distorts the allocation of bank credit to the real economy, by making banks give too much credit in too lenient terms to what is perceived as safe, and too little in too harsh terms to what is perceived as “risky”, is, I guess, just as dumb as the bank regulators who came up with that nonsense. And anyone who thinks that in Europe a free market´s hand would have allowed banks to leverage 40-50 to 1, as their 100% Basel II compliant banks did, has not the faintest idea about what free markets are. In fact as I see it, and I am no extremist, 30 to 50 dumb and arrogant bank regulators might have caused, and are causing, more damage to our banks, and to our economies, than what 30 to 50 al qaeda type of terrorist organizations could have caused attacking us jointly, over many years. Not once allowed to adjust the accounting rules from mark to mkt, to, mark to model, Ron, that was more like a free for all. And Per your statements are subjective to wide interpretations and thus have many outcomes depending on ones definition of “risky”. Poor education is risky, doing drugs is risky, and any debt at all, is risky. Once the usury laws were lifted, it was open season on the underclasses, and make your own tools to do your own rules. Now where this came from still has yet to be completely determined, and they certainly will pay every consequence due them, not that that will help today’s little man, but even the chance to help tomorrows little man, is worth a little pain and suffering today. And yes, as a consequence the difference for instance in the interest rates between what “the risky” and the AAAristocracy must pay, becomes wider than what would have been the case in the absence of these risk based capital requirements. I don’t see how anyone can use the phrase “free market” in referring to the financial services industry and keep a straight face. To call the financial services industry a free market is to totally ignore what it means to be a free market. If you want to argue that a market with massive government intervention failed to constrain risk, then I agree with you wholeheartedly. Indeed a great paper exposing what I have been arguing in different shape and forms since 1997, namely that “the risk-based bank capital regulations had perverse effects”. Thank you I had not seen it. But then consider that these “perverse effects” are not yet even really acknowledged by the regulators, which is of course the first step for correcting it. So the bad education was, and still is, the biggest problem faced by the ones who could not make it fair for all, but only fair for the chosen few. Well enjoy the pain in the neck, the spoils go to the victor in this case. That would be the Peter Wallison who correctly predicted in 2005 that Basel II would weaken American banks’ capital structure, and the Ed Pinto whose portfolio analysis was accepted by the SEC in its lawsuit against Freddie and Fannie. Exactly, but that hasn’t stopped the Denialist Industry from doing so. Maybe because the subordinated debt holders didn’t suffer any losses. I.e. they correctly predicted that Citi was ‘too big to fail’. Which is a failure of regulation, not of markets. Per lets go back to your first paragraph of this post, and start proving you and yours are more a part of the problem, rather than a voice of a solution. You juggle the perceived nebulous word around in public, but in private you carry the knife. During the day you are a professional, but during the night you are a contractor. So back to my point, since we know the rest of the world who is not completely behind the west attitude toward money and credit ratings states that if your country’s debt to GDP ratio is over 60%, you are a CCC rated country. How is it then that we lend to those country’s with a perceived AAA rating or your aristocratic rating, but at the same time ignore the astronomical debt/GDP ratio, and not ignore it, but promote it in public as something normal. This has yet caused another U.S. consumer lead bailout out of the Ukraine, who have a must be paid in full clause if their debt/GDP rises above 60% (which it did). And so now we will bark in congress about not paying the money in public, while in private it’s “we have to pay”. If you can’t see the double standard here, you are the blind leading the blind, and the problem not the solution here.